DVDs are now becoming obsolete and Laptops are coming without the DVD Drive now. Blu-ray discs are becoming popular for High definition media and new Laptops have USB Type-C port for all sort of communication. So if you have hundreds of DVDs and you want to RIP them into a computer to make it media server as a backup, then it’s a painful process to insert each DVD in the drive and manually copy them into PC. Andy Ayer also faced the similar problem and developed a beautiful Raspberry Pi powered Robot: Jack the Ripper Bot for automatically RIPs all the DVDs. This low cost Ripper Bot automatically picks up a DVD from the DVD stack in a tray, put it into the DVD drive and wait for the DVD to be completely ripped. Then when the DVD drive opens after the Ripping, it picks up the DVD from the Drive and put it into another Tray. Currently you can put 24 DVDs in the tray to be ripped in one shot. 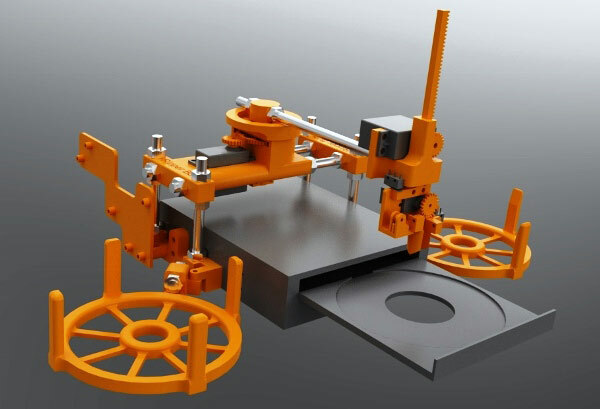 Parts of this machine are built using the 3D printer and you can access all related files including software, STL files for 3D printing, documentations, bat files for PC etc. here on GitHub. In electronics part, a Wi-Fi enabled Raspberry Pi is used to control the three servos. Pololu Maestro USB servo controller is connected to Raspberry Pi via USB and three servos are further connected to Maestro on its three channels. Check the complete electronics detail here. In software part, first you need to install the Pololu Maestro software in PC to manually determine the different values for the servos for positioning and gripping. In Raspberry Pi, Mono needs to be installed and previously determined servo values need to be entered in config.xml. You also need to copy some files to PC and install software to completely automate the process, where you just need to enter the no. of discs to RIP and you are done. Check here for all software detail. So if you also have a several DVDs to RIP and have no time to manually back them up in PC then go through this detailed tutorial by Andy and if you have any trouble then Andy created a complete section for troubleshooting.